This soup can be prepared a day earlier. For me, I double boiled them the nite before. When it cools down , I keep them in the fridge. I just have to heat them up and add in the enokitake when dinner time comes. Easy...isn't it ? I prefer to double boil chicken herbal soup , for I like the clarity of the soup rather then direct boiling , the soup will be cloudy. You can serve this soup with vermicelli or ' mee suah ' ..it is real comfort food when you feel like eating anything too heavy or when one is not feeling well. For the chicken herbal soup, I used 1/2 free range chicken , 1 tbsp of 'kei chi ' ( wolfberry ) and 10 pieces of 'yuk chuk' (soloman's seal ) and double boiled it for 1.5 hrs....Mmmmmm a bowl of slurrrrrpy hot steaming soup ! Place all the soup ingredients except the enokitake into a porcel soup pot . Cover with a lid and double boil it for 1.5 hrs. Add in the enokitake and salt. 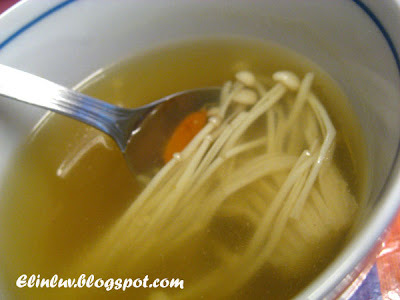 It can be taken alone as a soup or as a soup base for vermicelli or any noodles. a very simple and nuitrition herb soup, I cook herb soup at least twice in a week, but i use the pre-mix package, next time I also want to cook this way. 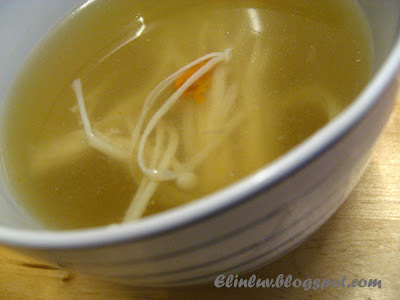 I cook this too but I boil it instead of double-boiling and I didn't add enokitake. Going try this next time. I really like the pictures of this soup. Light and healthy. Can't beat that! I like the enoktake mushrooms both stir-fried and in soups. In winter, these mushrooms are perfect to do the satay hotpot...simply marvellous. mmmh....I love Chicken Soup! 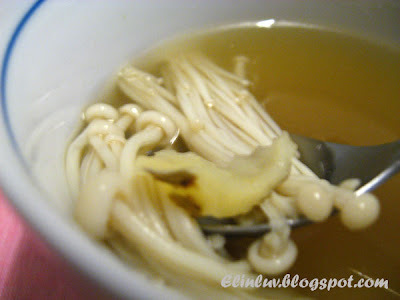 =) I would really love Herbal Chicken soup!!!! 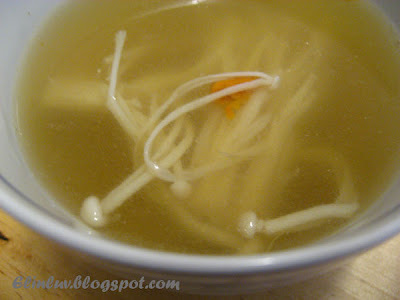 Mushroom in soup always the best combo because it will brings out flavour especially the sweetness of the soup. Anymore left for me? hehe.... I love eating my rice with soup(sounds like a kid huh!) and I always do! Hope you're having a pleasant evening. I love this soup. Looks so clear and healthy! Just a lovely soup. Wonderful job! I love it. I want some now. Simple and delicious! I love the taste of enokitake mushrooms and I usually use them in stir-fries. Nice, clear soup. 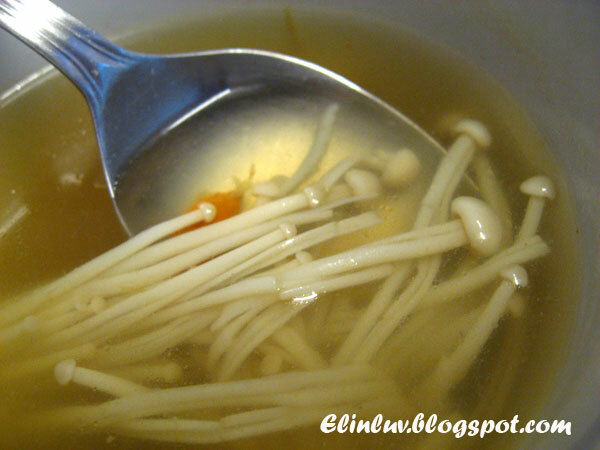 But I've never tried adding in the enokitake mushrooms, should do so in future. That's a great idea to use leftover to make the stuffing. Your herb soup simply delicious and healthy too! Roll a small bunch tightly inside a thin and long slice of pork and fry it with your favourite sauce!